Nothing on two wheels turns heads like a fat bike! They are truly compelling. With their oversized tires and impressive traction, these sturdy bicycles can ride virtually anywhere. And they look incredible. Why ride a fat bike? Good question. Basically, they ride anywhere. These monsters give you unprecedented traction, riding easily on snow, mud, slick rock, sand or even ice. And they’re way more responsive and fun than you’d expect. Unfortunately, they also tend to be expensive. So for this article, I want to focus on five cheap fat bikes that review nicely and will serve you well. For each bicycle, I’ll go over the features, capabilities, pros and cons, along with a short verdict on what it’s best suited for. Ready for some reviews of inexpensive fat tire bikes? Let’s get started! Updated with new fat bike reviews! Bike models come and go, thanks for your patience! If you’ve done research or read reviews, you’ll know fat bikes can be expensive! There’s a good reason: these oversized frames are custom made in low quantities. The beefy bikes have more raw materials in them, which pushes up the price tag. The bicycle pictured up top is a Schlick; it’s an amazing, beautiful, bike, but not exactly inexpensive. If you want a cheaper fat bike with pretty good reviews, you’ll need to focus on bigger brands. A cheap fat bike will probably also have a heavier frame, often steel instead of carbon or aluminum. Again, not a big deal, just a little extra weight on an already heavy bike. Overall, you can get a great quality fat tire bike for a lot less than you’d think. So let’s get on to the reviews! The deceptively simple Bullseye Monster, by Gravity is a head turner, and an affordable one at that. 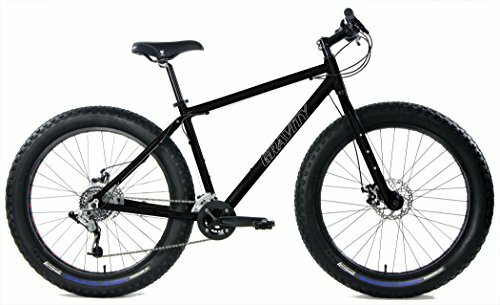 Gravity’s fat bike is one of the cheapest I’ve come across. Don’t let the low price dissuade you. This particular model is one of the best fat tire bikes on the market for a few reasons. The frame is beautiful, and the geometry is upright and planted, with a good stance for mixed riding. Honestly, it reminds me of a vintage ’80s hardtail mountain frame. It comes in four frame sizes with a long seatpost, so you have room to adjust. The tough, classic welded aluminum frame is paired to an oversized front fork. The use of S6 aluminum alloy means the bike is lighter than it’d be with steel, and excess vibrations are soaked up by the huge tires. Speaking of the wheels, they’re also aluminum alloy (26 inch) with quirky square cutouts to reduce weight. They run on Mission tires with 4-inch wide tread. The drivetrain is basic but effective: you have 16 speeds (2×8), using Shimano Alivio/ SRAM derailleurs and EZ-Fire shifters. This affordable fat tire bike is equipped with capable Tektro mechanical disc brakes. I would’ve loved to see hydraulics, but these work just fine. It’s rounded out by an alloy riser handlebar, and large platform pedals. It gets top marks for weight too. Assembled, it comes to 35 pounds for a medium frame. As low-cost fat bikes go, that’s very light. The Monster lives up to its name; it’s a blast to ride. This bike handles well in sand, snow and muck. Its upright stance, great looks, huge tires and low price tag make this one of the better fat tire bikes in my estimation. It makes perfect sense that one of the funnest fat tire bikes comes from a company known for their BMX lineage. With the versatile Minnesota 2, Framed has created a fat bike with the soul of a BMX. Not only is this a good looking ride, it’s also a lot of fun, built with a shorter top tube to give you tons of control. The frame and fork on the Minnesota 2.0 are made from 6061 aluminum alloy, saving a noticeable amount of weigh vs. steel. The tubing is oversized but classic, the only modern touch is the slight bend in the downtube where it meets the head. Wide flat handlebars complete the look: no nonsense and rugged. The wheels are massive. Framed decided to go with a 29’er wheelset for this model, and these single-walled alloy wheels absolutely rip over debris and terrain on well-balanced, 4-inch Vee Rubber tires. The rim cutouts cut down on weight, and they look fantastic. Framed saved money with lower end KT Quando hubs, but the quick release skewers are a nice touch. For gearing, the Minnesota 2.0 sports a Truvativ double crank (38/28T) paired to a SRAM X7 front and X5 rear derailleurs and shifters. The X5 group offers great value as an entry level setup; I wasn’t expecting to see it on any of the fat bikes reviewed today. To stop, the bike relies on capable Avid mechanical disc brakes. Again, hydraulics would have been preferable, but it lowers the price. The Minnesota’s frame geometry is unique. With a seat tube angle of 73.5°, and a shorter top tube, the ride is more upright than any other bike listed here. The BMX heritage is clear: controlled, with a free ride feel. This responsive, snappy bicycle is a perfect match for trails. The Minnesota comes in around 37 pounds for a medium frame. For well under a thousand bucks, it’s one of the more impressive cheap fat tire bikes available today. If you’re looking for the most bike for your money, consider Trek’s impressive Roscoe line of mid-fat tire bikes. They’re built to withstand the rigours of intense riding. Trek is a major brand. Their presence in the fat bike market creates a welcome downward pressure on everyone’s price tag. This isn’t just a standard mountain frame with some oversized rubber on it. This is a specifically designed, fully equipped, yet still affordable fat tire bike. It’s monstrous, it’s slick, and it’s eye catching; one of the best, cheap fat tire bikes you can find today. The stunning frame and fork are made from Trek’s Gold Alpha extruded aluminum. It’s beautiful with no wasted metal, and ensures that the bike is tough yet lighter than expected. The hard tail frame has an aggressive, clean, modern look to it. Any fans of current downhill geometry should absolutely love the looks. The FSA bottom bracket is sealed, and the crankset is a Shimano Deore / FSA hybrid, with 10 speeds. The whole ride feels very dialed in and versatile. It shifts nicely, and the micro gearing gives you huge power, so it’s a beast on trails. The rims are Alex MD35s, rolling on 2.8-inch Kenda Havok tires. Those tires are a hair smaller than the rest of this list, but still comparatively huge, with excellent tread. They’re well suited to a wide variety of riding. For severely snowy weather I might upgrade to something with more grip. The ride stance is mid-aggressive, with mountain handlebars. It’s comfortable, and you’ll appreciate the heads-up, controlled feel when riding through muck. Frame size ranges from 13.5″ – 23″. 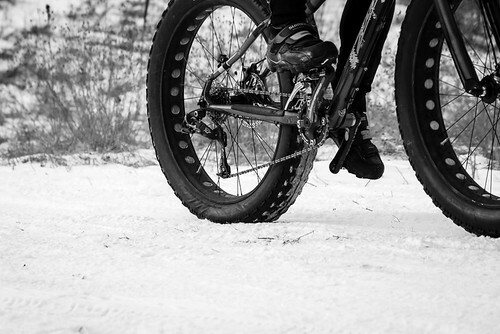 It tips the scales at 33.7 pounds, which is featherlight as inexpensive fat bikes go. Priced affordably at around $1,000, the Trek Roscoe 6 reviews well and is among the best fat tire bikes in this price range. Never one to be left out of the party, Diamondback has debuted their entry-level fat bike, El Oso Uno, and it’s a stunning offering. Meaning “the bear”, this appropriately named monster is capable of rolling over almost any type of terrain. It’s particularly well-suited to winter conditions, but it’ll crush sand too. The custom, butted-steel frame and steel fork are built to take a beating (and come with a lifetime warranty.) But it’s a refined beast; with sealed cartridge bearings and an included rust-resistant chain, it’ll ride smoothly in harsh conditions. The single-walled wheels host huge, toothy, 26 inch Chaoyang tires, with 4 inches of width. The rim cutouts save on weight. The Oso’s large (160mm) Tektro mechanical disc brakes are well-suited to stop well in mucky terrain. Shimano Alivio derailleurs and shifters and 27 gears should keep even the pickiest cyclist happy. The 150mm rear hub spacing is atypical, but shouldn’t cause any troubles. The lines are simple, brutal and gorgeous. The white paint on the huge black tires makes it really pop. It comes in at just a hair over 40 pounds (around 18kg); certainly heavy, but not as unwieldy as many others in this neck of the woods. Diamondback has more in this line too. Big brothers El Oso and El Oso Grande each carry a bigger price tag but better componentry. That said, this entry level option is competent in its own right. It’s a great fat tire mountain bike worth every penny of the cost. 5) Dolomite: A good quality fat tire bike under $400? Believe it! What if your budget is much lower? In the bike world, like many others, you get what you pay for. Still, that doesn’t mean you’re out of options. Mongoose has somehow produced a decent quality fat bike for under $400. The ridiculously affordable Mongoose Dolomite doesn’t have the best components, and can’t compete with any of the above models. Still, you can experience the fun and versatility of a fat tire bicycle on a tiny budget. The Dolomite features a standard steel frame and fork with slightly oversized tubing. Riding position is neutral. It’s a 17″ frame, and unfortunately that’s your only option. The wheels are alloy, but heavy, with unbranded 4″ tires that have a very mild tread to them. They’re best suited to light snow, sand, gravel and pavement. I was surprised to see dual disc brakes at this price point. They’re brandless, mechanical discs that can be tuned up for decent stopping power (I do recommend a professional tune here). For shifting and gears, you’ve got a basic Shimano Altus rear derailleur paired up to a twist grip shifter. Seven speeds should be more than enough to work with, though be prepared for some routine adjustments. The whole bike is 48 pounds. Heavy? Absolutely, but rideable. At less than half the cost of every other bike on this list, that’s the trade-off. Despite its low price, this cheap fat tire bike reviews extremely well. Most people who buy it realize that it won’t compare with higher end models. It provides inexpensive fun and exercise whether on the beach or in the drifts. If you don’t have a ton of cash, consider the Dolomite by Mongoose. It’s a good, affordable fat bike that you can easily upgrade over time. These five are just a handful of the great, cheap fat tire bikes you can find these days. Aficionados and snobs might tell you that these budgets are too low, but I’d disagree. The five models reviewed above are a great way for anyone who is curious about the ride quality of a fat bike to get into the category. They’re inexpensive enough that you won’t need a second mortgage to afford, but capable all the same. They seem to have great resale value too, due to their relative rarity. So what are you waiting for? Get fat, get happy! Hi, I am going to be getting a giant momentum have you checked them out? I am getting a demo from the LBS so I am getting a pretty sweet deal. What do think? Thanks. Yeah I have! (You mean Giant’s Momentum sub-brand, right? Which model?) Giant is excellent, I think you’re gonna be really happy with it. 1. fat tire, not so heavy I cannot lift it onto my bike rack. 35 would be tops. I rode a carbon in Duluth that was 18# but it was so expensive. 2. want to sit more upright since my back appreciates this position more. 3. don’t want to ride through deep snow–just on light snow covered paths, trails in the woods and on the Minneapolis Greenway which is usually plowed somewhat. 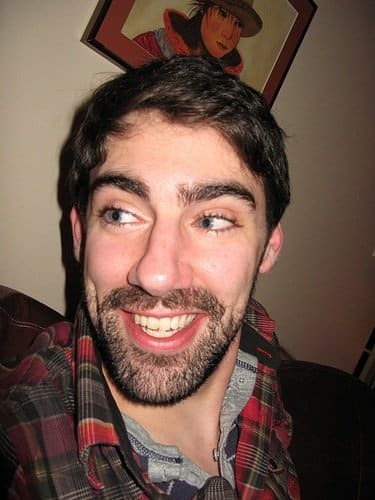 4. don’t want to kill myself just making the wheels turn around–want something that isn’t a humongous effort to get rolling and then keep rolling. 5. would spend up to $1000. looking at the Minnesota, the Ice Cream Truck (pretty heavy for me) (found a sale in Plymouth) and ECR. Please help. The more days that go by with me riding a stationary bike inside the worse my mood is. 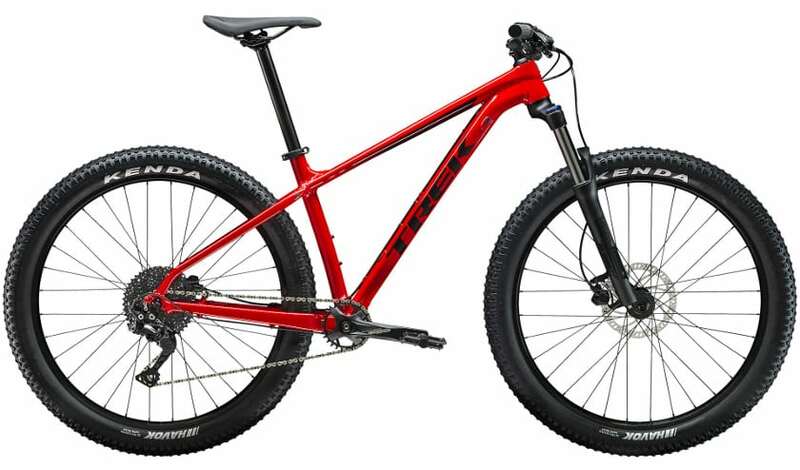 Well under 35 pounds for below $1k is a tall order, but the Gravity is right around that weight (less if you pick a small frame) and it would probably meet your needs. The Framed is a great choice too. And don’t fret, they are way easier to pedal than they look! I hope that helps. Thanks for the informative review. 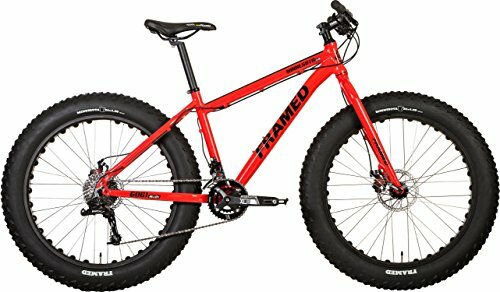 My wife wants to explore what the fat bikes are all about. We have been riding mountain bikes for many years but don’t do any serious terrain. I have seen many fat bikes in the trails of New England where we live. If we purchased fat bikes, they would most likely become our primary bikes. We also ride hard roads and paved trails on occasion. Our intent is to take the new bikes with us in our RV when we retire next year. We expect to be in a wide variety of terrain all over the country. 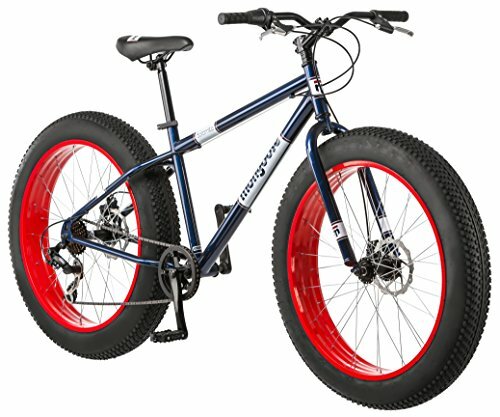 With all of that said, would you recommend fat bikes as our primary, or should we stick with a more traditional mountain bike with + size tires? Hi Dave! Fat bikes excel riding on snow, sand, gravel, grass, stuff like that. Trails too, though they’re not suited to serious downhill. You definitely could replace your mountain bikes with them, but you’ll sacrifice having suspension parts and a bit of agility. Do you have a bike shop nearby where you could do a test ride? Thank you for a much needed set of reviews on these less expensive models. Please include the weight of the Minnesota, the Louis Garneau (what is “well under 40 lbs?”) and the Mongoose Dolomite. Hi Larry, you’re very welcome. The Minnesota is listed at 34 pounds 8oz. but that’ll be for the smallest frame. Medium is roughly 37 pounds. The Louis Garneau is 35lbs for a medium frame, and the Mongoose Dolomite is 48lbs. Another thing to look for is a used bike. The seller mistakenly advertised it as 24″ wheels and size Small. I looked closely at the pictures and enailed him to confirm. He wrote back and I could tell he had no clue about bike sizes. Turned out to be 26×4.6 rims/tires….a 17.5″ frame or Medium. It rides like new but is speckled in scratches all over. So i got my fat bike and for less than i figured. He was asking $400 and i offered him $380 and he was not having it. So, $400 it was! And, no it is not stolen. I ran the serial number thru my local police. I also checked all bike forums locally to see if anyone had messaged about 1 being stoled. Its clean and clear. The buyer ran into a wad of money and when it was dissapearing he sold the bike to recoupe some funds. I would also recommend researching protective undergarments with padding to protect bones and joints that could take a hit. Accidents happen. Unfortunately most of the selections are designed for slimmer, competitive riders, but there are other options such as motorcycle jackets and pants. And you can get creative and customize parts on your own. I am fit for my age, but I don’t want any broken bones at 67. I don’t dress out like a football player, but depending on the situation, I will wear minimal protection. Fat tire bikes are cool! I own a Sikk UFO 7 speed with the cut out wheels, it’s hot rod satin black with red wheels! I added some goodies to it and it’s a great bike! I got it for 475.00 shipped, not a bad price! I want to add a jockey rat rod style shifter on it for side shifting, lots of cool ideas! I added some soma polished billet bullet led lights out back and a leather bag on the ape hanger bars along with a red skull mounted to the neck where the reflector once was! I also changed the pedals to Bike Nashbar black pedals and some ODI Rogue locking grips! hi i have seen a few cheaper fat bikes on ebay for £99 i was wondering what you think about these as they are from china and do you think they are worth buying? Hi Stephen, no I wouldn’t do it. They’re £99 for a reason! I am also looking at Motobecame ie. Bullseye monster and Boris X-9. How do they stack up with aforementioned Fat Bikes? I chose the Raw Black Soul Stomper from Soul Beach Cruisers. The Stomper has one heck of an attitude and still manages to be graceful in its designs. With its teardrop? shaped top and down tubes, mean stiff front forks(throw the traditional oval top part of the fork out the window) and just everything the bike’s design offers I was stopped in my tracks when I saw my bike. It’s a perfect financial compromise between something like a Surly and a Mongoose. At $699 for the single speed Raw Black Stomper I couldn’t be more satisfied. Hi, thanks for the review. I’ve been looking at the kawasaki sumo… I’ve seen mixed reviews on amazon for it. And, found the gmc Yukon… Any thoughts on that one? Appreciate your help. Hi Alex, they’re similar. I haven’t been super impressed with GMC’s other models in the past. I wouldn’t be too deterred by the mixed reviews. Really the only major deterrent (and complaint in the reviews) is the weight, and the GMC actually weighs more. The Framed Minnesota has 29er wheels? I don’t think that’s correct. My mistake, typo! Thanks for the catch. 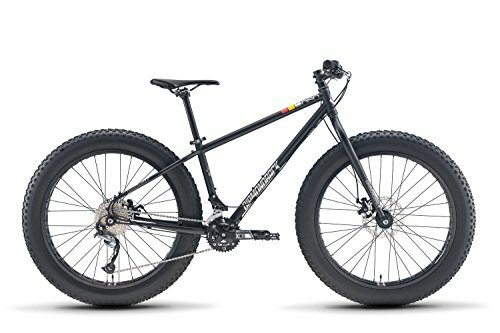 I appreciate your list of affordable fat bikes. I am currently in the market and in addition to those mentioned, I am also considering the motobecane and the charge cooker maxi.